Love the community atmosphere! Great happy hour, staff, and people. Had a great time here very nice people working here. Excellent hostel, great location and good price. The staff were very helpful and the pub crawl organised by them was fun. The reception was manned 24hrs, all the doors locked with a keycard and cages to store your valuables. The luggage store was also very good with keycard lockers. It was my second stay in the Chill out hostel. 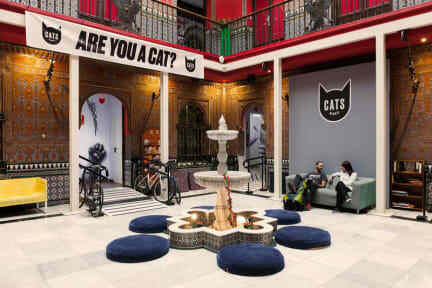 I have been here as well as the Cats party hostel. I just love the vibes here. The staff is friendly and the location is the best you can find. Pleasantly surprised. Actually really liked this hostel, kind of outdated in a way but very clean! Perfect location! Would definitely recommend! Breakfast is not actually free as advertised on some sites. Sangria fountain was nonexistent (don't believe the photos). Staff was a bit removed and overall vibe was not very friendly. The room was claustrophobic and suffocating. WIFI was not working. Tries too hard to be a party hostel. The main terrace is nice. But if you're a girl in this place, expect to get hit on by the utter amount of dudes who come in here with the mentality of getting laid. If that's not your vibe, run The staff seems nice, but stressed and overworked and at my time there the other guests were rude and inconsiderate, as well. When I woke up, there was a 40-something guy passed out on a couch in the common area, snoring really loud. I found it funny, others may not.